Even though I already posted Ash's room reveal, I wanted to show how we did a couple of projects. 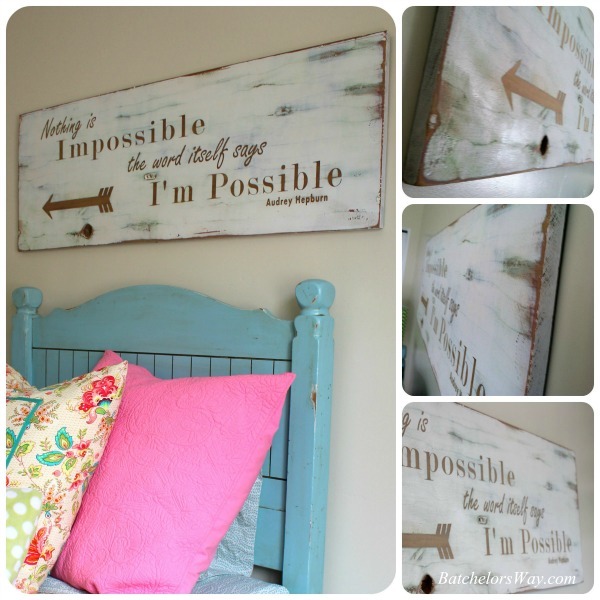 If you missed her Rustic Charm Bedroom Reveal, go check it out! Today let's talk about that sign above her bed!! Since this is her room I wanted her to pick out the saying for her sign. Ash also wanted to help with the sign, so she did most of this project with just a little direction from me. 1. Once she picked out the quote, we played around till we found the fonts and sizes we wanted for the words. Then we used my Silhouette and cut out the words. We used an old board I had in the scrap pile. 2. We used up scraps of vinyl for this project; it didn't matter the color. We placed all the words on the board. We used painters tape to create an arrow. 3. 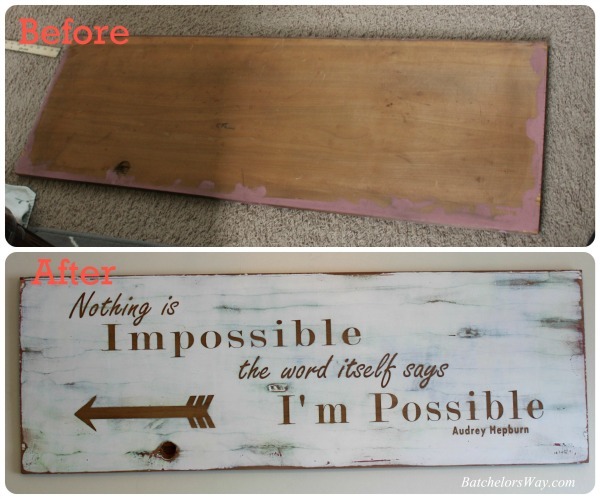 Using a small foam roller she painted over the letters and the board with splotches of blue and green. You may notice the board we used already had some purplish paint on it. Once the colored paint dried we painted a couple of coats of white paint over the whole thing. 4. After everything was really dry, she carefully pulled up the vinyl letters. 5. 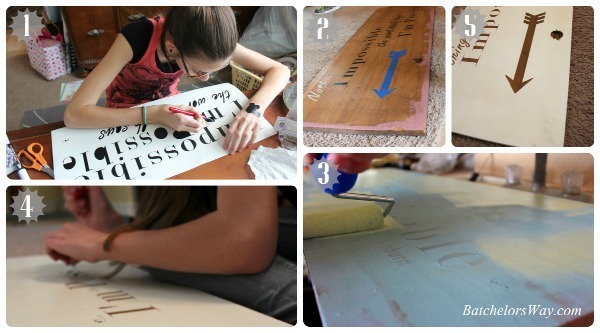 Letting the natural wood show through where the letters and arrow were. Then we went to town sanding and distressing. We really wanted it to look old. Here is my Before and After photo. I know it looks like junk at first. But she loves the after! Best part was that it was soooooo easy!! And cost nothing, not to mention I used up some extra supplies that were just laying around in my way!! Triple score!! I love her choice of quotes and I just love her! Good job baby! What saying would you put on yours?